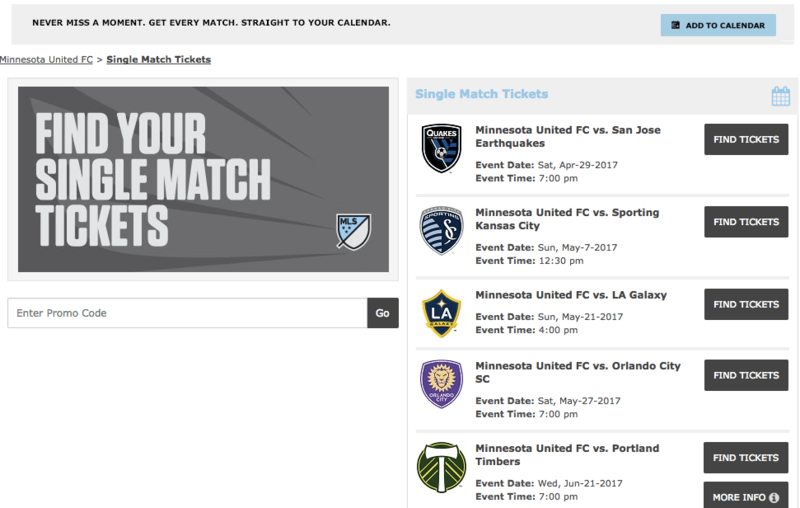 2017 continues to be an exciting year for Ticket Alternative’s client, Minnesota United Football Club (MNU). In addition to a big move to Major League Soccer (MLS) and a new stadium, MNU has been making a number of exciting changes! From the implementation of 3D seat selection to Marketing tools that make ticketing and communicating with fans easier, MNU’s overall goal has been to streamline efficiency and improve fan experience. 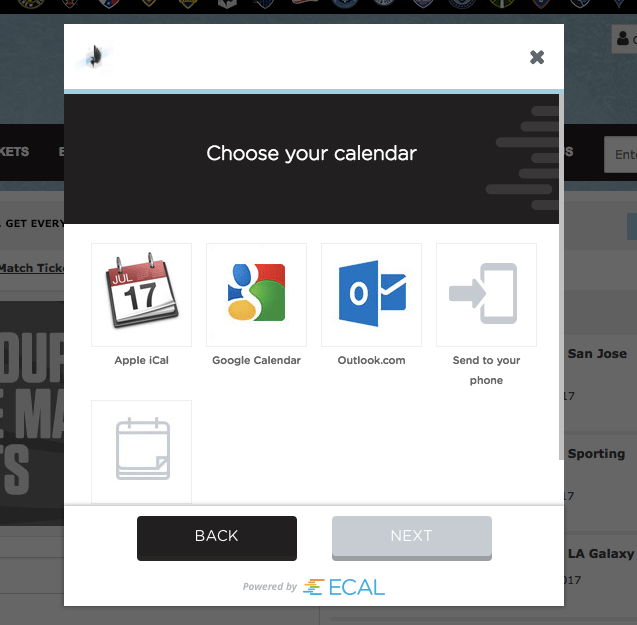 Their newest development comes with the integration of ECAL, the world’s first calendar marketing software, perfect for any level of sports organizations that need to create, display or communicate events content. Whether its sports schedules, TV programming, corporate events, on-sale dates, offers or birthdays, ECAL allows MNU to deliver content straight into fans’ personal calendars. Fans have the ability to add any of MNU’s scheduled games…or even the players’ birthdays, directly to their personal calendar with an easy-to-find “Add To Calendar” button, located on MNU’s ticketing page. 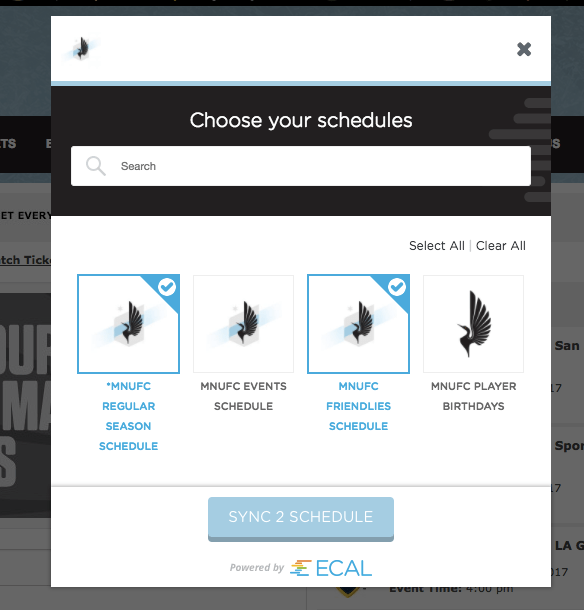 Fans simply select the schedules or events they’d like added to their calendars from a list of all available options and choose the type of calendar they use. Once they select sync, they provide account log-in information for their calendar and the events are automatically added! Once complete, ECAL integration offers MNU a powerful marketing communication and up-sell tool. Promote pricing promotions, parking, merchandise offers, etc. Send timely event information, from the basics like reminders and weather to important patron information like time changes or prohibited items. Alerts are communicated instantly through the patron’s calendar app. We are excited about MNU’s continued growth and are proud to share their inaugural MLS season with them! For more information about ticketing and event services through Ticket Alternative, contact Iain Bluett.